Birdsville had been on our bucket list for years. I’m sure it’s on a lot of people’s travel lists: Birdsville, that legendary town at the junction of so many iconic outback tracks and roads. After a year of planning, and a week in the Simpson Desert, in June 2013, we finally arrived in Birdsville. We weren’t disappointed – and neither will you be. Here’s our guide to Discovering Birdsville – everything you need to know, before you go. In case you’re not sure, Birdsville is located in outback Queensland, on the edge of the Simpson Desert. It’s 1587km from Brisbane according to Google Maps (distance does depend on the way you go). You can fly in, but seriously… slap yourself! Drive there. You won’t regret it. 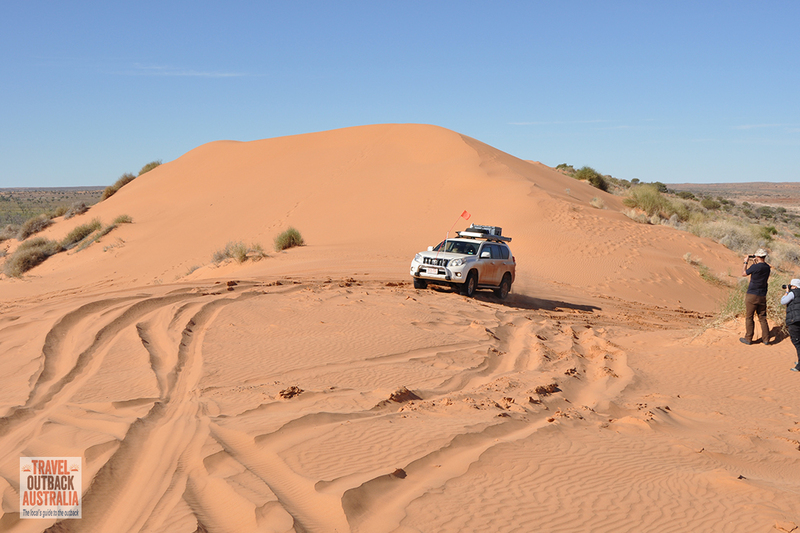 There’s quite a few ways to get to Birdsville, either by fabulous 4WD tracks or good unsealed roads. One great thing about Birdsville is that it’s pretty compact, so you can walk to a lot of the sights from wherever you’re staying. As you’ll probably spend a lot time in your vehicle to get there, we really encourage you to get out and walk around the town – it’s safe, it’s friendly and you’ll see far more. 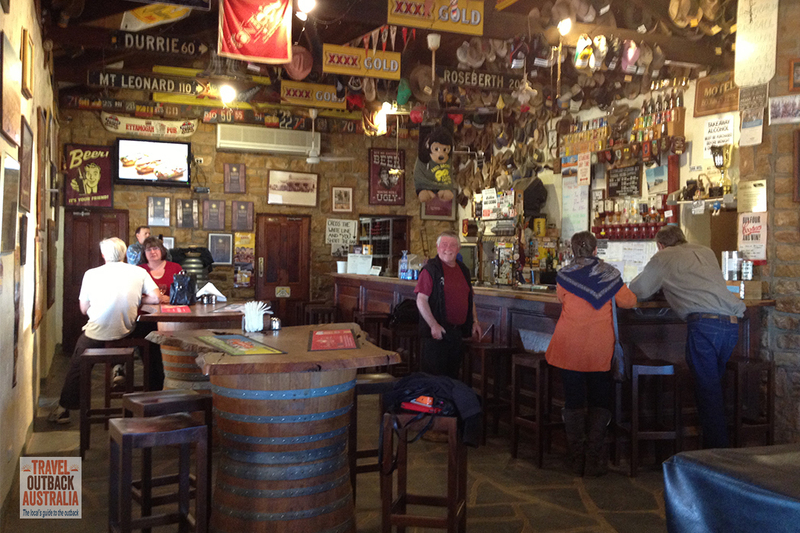 You really can’t go to Birdsville without a trip to the Birdsville Hotel. The Birdsville Hotel was built in 1884, and still looks pretty much the same on the outside. Inside, there’s a couple of inviting bars just begging you to pull up a stool and sip a cold beer whilst telling some tall tales. Outside, there’s a big fire pit for chilly winter’s nights, where you’ll meet lots of other travellers and locals. The hotel is very child friendly – there’s a playground and the children we were with were made to feel very welcome. You can also stay at the hotel – more on that below. Located 35km from Birdsville, the 40 metre high Big Red Sand Dune is another bucket-list item for many outback travellers. Although you’ll need a 4WD to drive up it (I do believe that some skilled 2WD drivers have topped the dune from the Birdsville side), you can drive out to it and walk up it, too. It’s perfect for sunset drinks and if you’re in a 4WD, the obligatory I’ve-conquered-Big-Red drive-up. Whilst it’s not that interesting to look at, every September, the Birdsville Races are held and attract crowds of thousands from all over Australia (and the world). You’ll have to drive to this one (although it’s not that far- 3km). Even better, go in September and join in the craziness. 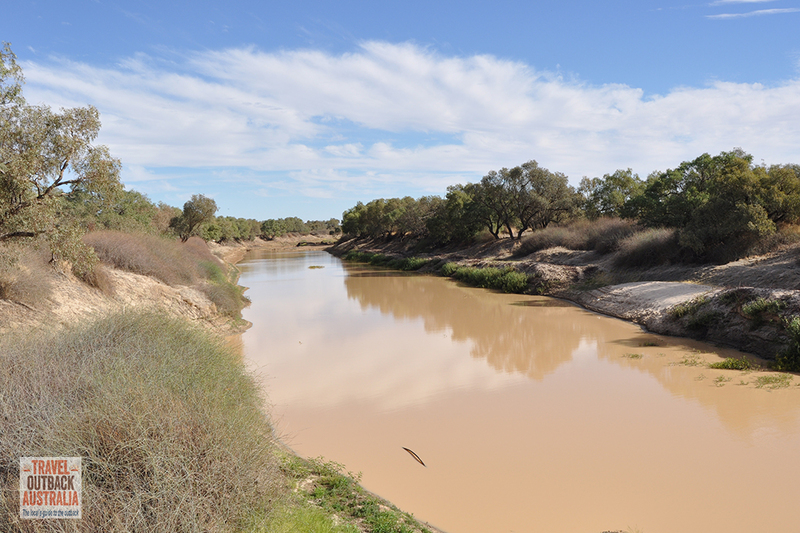 Birdsville sits on the Diamantina River, which has adjacent bush camping sites. It’s a short walk from the centre of town. When we were there a freshwater crocodile was resident, apparently dumped there by some unkind human. We tried very hard to see him, but we had no luck. In August 2013, Mr or Ms Croc was caught by local ranger, Don Rawlins, and crocodile catchers. He/she turned out to be only a metre long and no real threat to humans – freshwater crocodiles DO NOT eat people – that’s saltwater crocodiles. He/she was moved to a Gold Coast theme park. 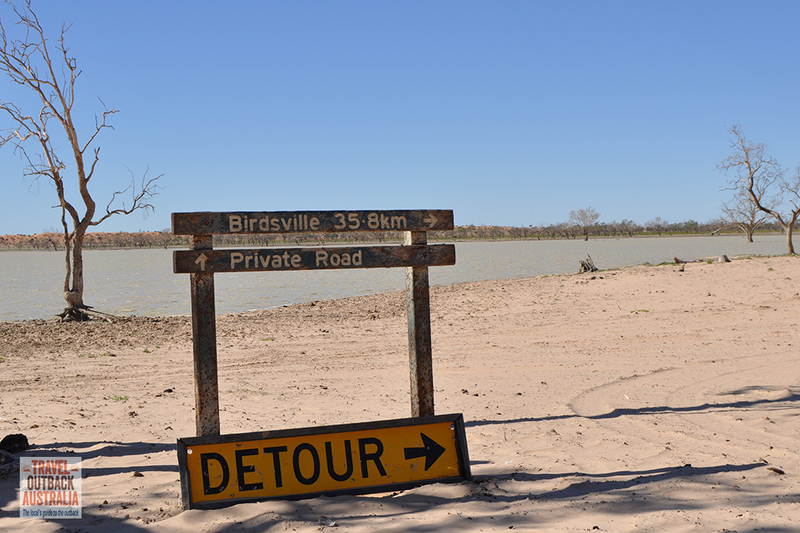 The Birdsville Billabong is accessible either from about 200m past the town grid on the right or near the caravan park. The Billabong is a great place to swim, go bird watching or just sit and relax. Well known local, Kelly Theobald, recommends Pelican Point as one of the best spots to appreciate Birdsville from (access to Pelican Point is along a signposted track on the right, about 200m from the town grid). 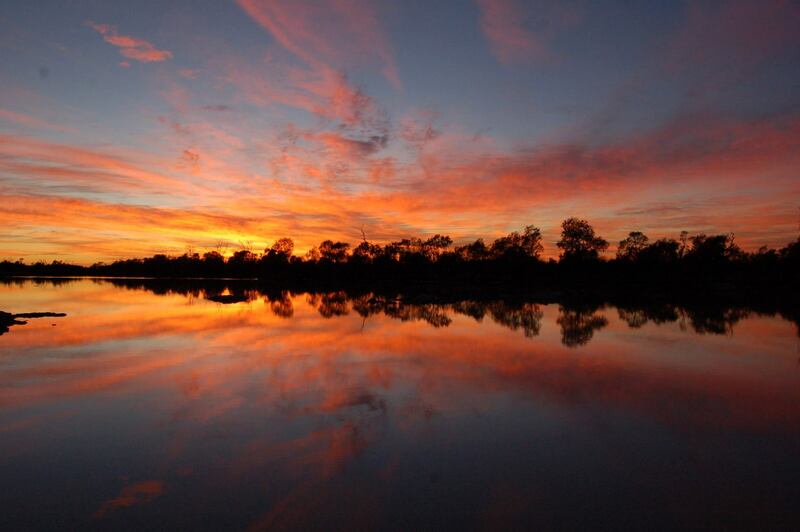 As you can see, sunrises on the billabong can be spectacular. If you’d like to see some local artwork and get latest road conditions and LOTS of local tourist advice, go check out the Wirrarri Visitor’s centre. The Centre has a well stocked souvenir and bookshop, where you can get all those lovely little local histories about the Diamantina Region that are hard to get elsewhere. The Wirrarri Visitor Centre has wireless internet access and houses the town’s local library – which I really loved checking out! 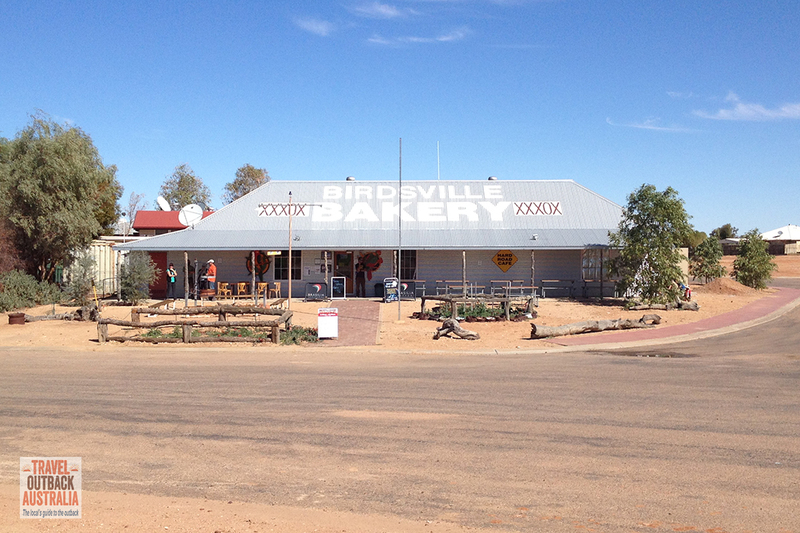 Birdsville’s Bakery was definitely high on the agenda for Gary after a week in the Simpson Desert. We couldn’t keep him away from there… and it seemed like everyone else –visitor and local alike- had the same idea. Have a camel pie, a cappuccino or some carrot cake. You’ve got a few choices for accommodation in Birdsville. 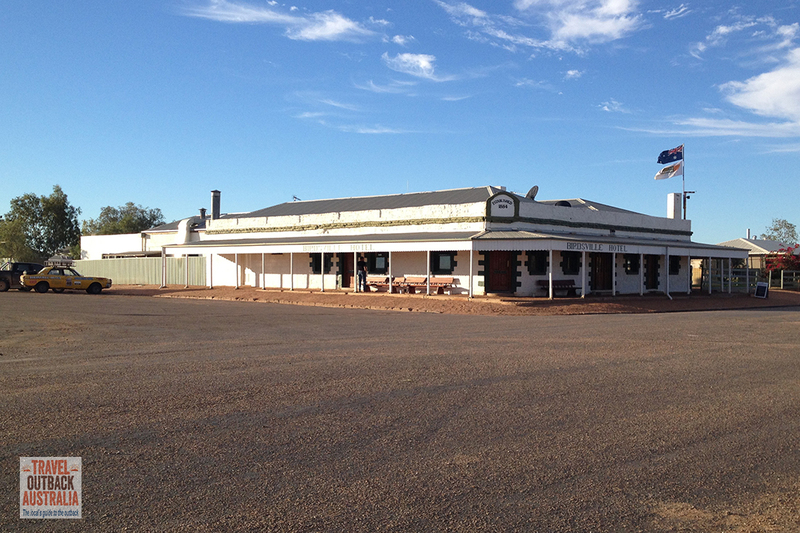 The Birdsville Hotel has 27 modern motel rooms, offers breakfast, lunch and dinner and a great atmosphere. Click here to go to their website or call for bookings: (07) 4656 3244. 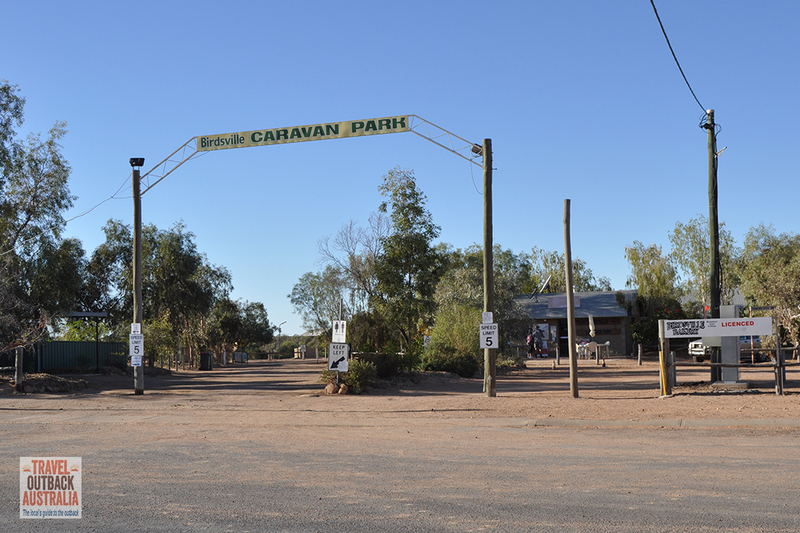 Birdsville Caravan Park has ensuite cabins, backpacker’s rooms (no ensuite), powered & unpowered caravan sites. This is where we’ve stayed both times we’ve visited Birdsville. After camping for over a week, we spoiled ourselves with one of the backpacker’s rooms. 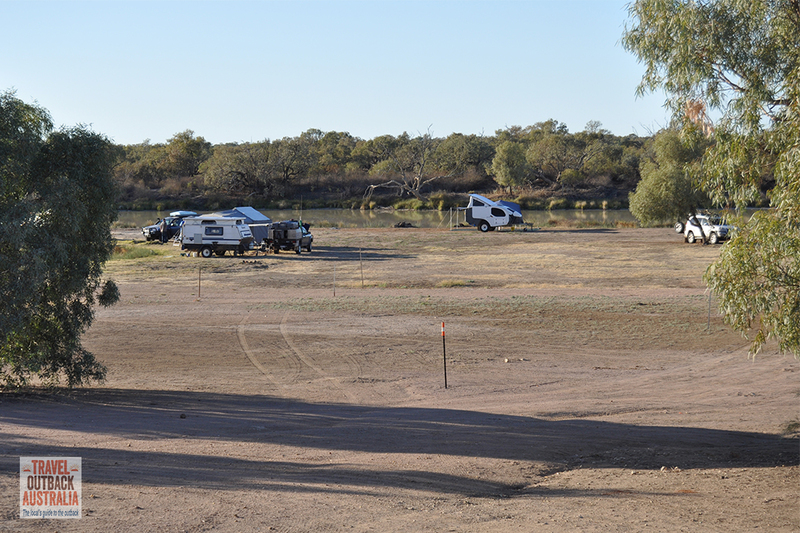 Free camping is available just outside of town, on the Birdsville Development Road. Just head out over the bridge across the Diamantina River, and look to your left. Many of these spots have water (you’ll see random taps popping up everywhere) and are set amongst the Gidgee Trees. Be warned – there is almost not firewood for about 5km in any direction around Birdsville, so it’s a good idea to collect some well before you reach the town. 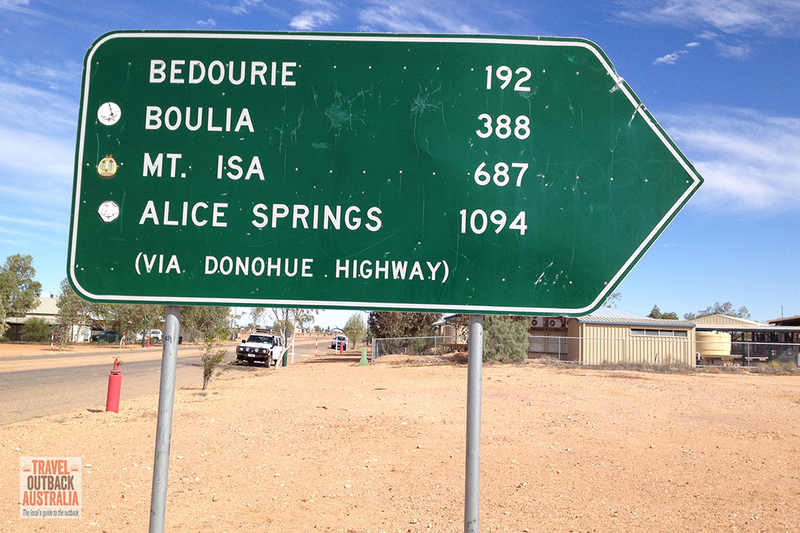 There’s a couple of places in Birdsville to go for both fuel and basic groceries. 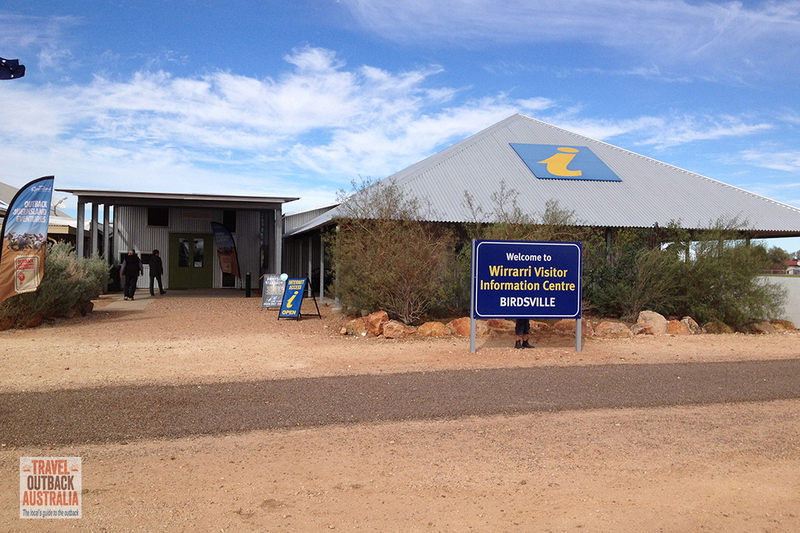 Please note that there are no LPG/Autogas supplies in Birdsville. The Birdsville Roadhouse is open 7 days and has diesel and unleaded fuel. 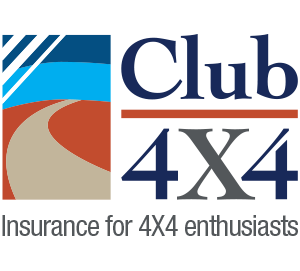 They’re able to do tyre and some mechanical repairs and also have an outback, off road recovery service. The roadhouse also has basic groceries and souvenirs. Owned by Bronwynne & Peter Barnes, we can tell you that the Roadhouse is friendly and the people behind the counter are happy to chat to you. Also doubling as the town’s post office, Birdsville Fuel Services offers diesel, unleaded and Premium unleaded fuel, along with basic vehicle and tyre repairs, and some spare parts. A good range of groceries is available and we have it on local advice that they have additional grocery items “…out the back …” – so make sure you ask. The cooler months of the year, from May-September are the best times to visit Birdsville. You can visit in summer, but be warned: Birdsville is one of the hottest places in outback Australia. You can’t drive in to Birdsville via the Simpson Desert in summer, either, as it’s closed to visitors for safety. From May-September, you can expect clear days with perfect blue skies, and daytime temperatures of around 20-25C. Winter nights often fall below 0C (30F) in this part of the world, so make sure you take plenty of warm clothes and a warm sleeping bag. We’d were really impressed with Birdsville – so much that we extended our stay and then when we encountered wet weather further down the track, came back and stayed again. You’d probably find enough to fill in a couple of days here if you do a few longer trips out of town. If you’re coming in from a Simpson Desert Crossing, then you’ll love the chance to enjoy a few luxuries. Perhaps the only bad thing about the town is that there is no real supermarket. 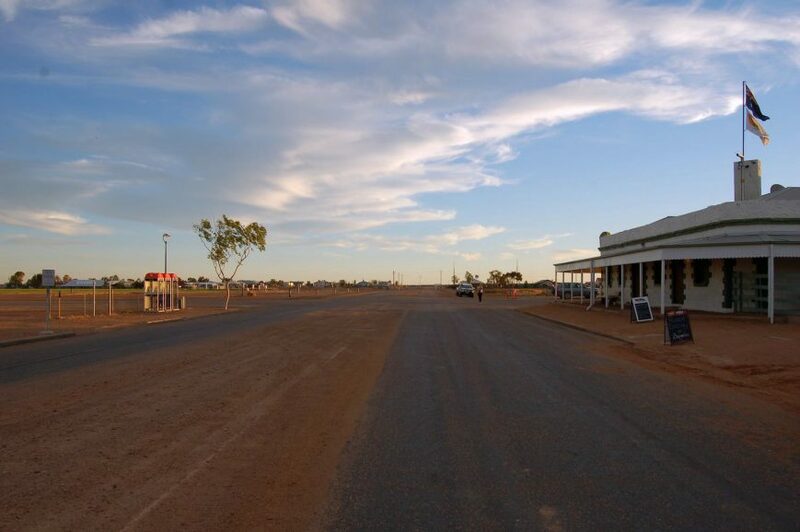 As we’ve said above, try Birdsville Fuel Services or the Birdsville Roadhouse for basic groceries. You’re looking at a trip to Boulia or Winton for a big re-supply, however if you’ve done your homework and planned your trip, then this shouldn’t be a problem. We would like to acknowledge the assistance of the talented Kelly Theobald, who tragically passed away in October 2015, for her assistance with writing this post. A kindred spirit gone far too soon, who touched many and left a town heartbroken. What about the old hospital and the water supply cooling… thingy.